Rabbi Ovadia Yosef, 93, Shas's spiritual leader and a leading Halacha figure, passed away at the Hadassah Ein Kerem Hospital in Jerusalem on Monday, the hospital's director Dr. Yuval Weiss said. His family and close colleagues, including several Shas leaders and President Shimon Peres were by his side. The rabbi will be laid to rest at a cemetery in Jerusalem's Sanhedria neighborhood alongside his wife, Rabbanit Margalit Yosef, in what will likely be one of the largest funerals ever to be held in Israel. Hundreds of thousands are set to take part in the funeral which is set to begin at 6 pm. The rabbi's condition deteriorated overnight and his family members were called to the hospital earlier on Monday. 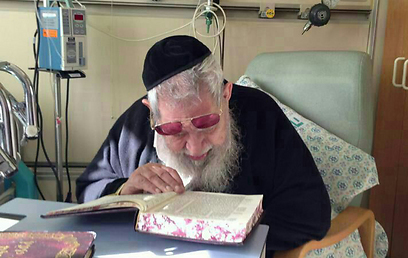 Rabbi Yosef has been in and out of hospital several times over the past few months. Some two weeks ago he was admitted to the Hadassah Ein Kerem's Intensive Care Unit and has been in serious condition since. He suffered from heart and kidney problems and was given a pace-maker. On Sunday it was decided to put him under anesthesia and on a respirator. MK Eli Yishai stepped outside the hospital, recited a Jewish blessing and then broke down into tears. "How will we remain alone. Who will lead us," said Arieh Deri, another Shas leader, as he sobbed uncontrollably. Yosef has been called the Posek HaDor (the generation's leading religious arbiter) and Maran (master) by his supporters, and a divisive and polemic figure by his detractors. Rabbi Yosef, 93, is survived by 11 children and a great many grandchildren. Some members of his extended family serve in senior positions in Shas and the educational and social establishments founded by the party. In 1973, Yosef was appointed Chief Sephardic Rabbi, a post which he kept for 10 years, before retiring in 1983. During his tenure, he issued a number of important rulings, including, for example, ending a longstanding dispute regarding the status of Ethiopian Jews by ruling that they are Jewish by Halacha standards and should thus be allowed to immigrate to Israel. In the wake of the Yom Kippur War, he also ruled that the wives of IDF soldiers missing in action for a long period of time were allowed to remarry, a ruling which has become known as the "release of the agunot." Following his retirement, the rabbi went into politics and in 1984, with the support of Rabbi Elazar Shach, headed the initiative to establish a movement of religious Sephardim – Shas. The party's target audience was members of the haredi and observant Sephardic public, who did not find their place in the existing political arena. Shas's rapid growth since its inception had brought about a revolution in the Israel's political landscape. Rabbi Yosef authored numerous Halacha books and publications. His books reflect a profound knowledge in all fields of Torah literature, both by Ashkenazi and Sephardic adjudicators. His weekly sermons, held at the Yezadim synagogue in Jerusalem, are broadcast by satellite in several countries. Rabbi Yosef was well known for his sharp tongue, and his expressions triggered public outrage on more than one occasion. Among other things, he said that the six millions Jews who perished in the Holocaust died because their souls were the reincarnations of sinful souls, and called the Arabs "venomous snakes." Some of his most controversial comments referred to women, including the statement: "A woman without sons is worth nothing… sometimes you hear at the ladies section in the synagogue the women babbling. What about? The one tells the other how beautiful her dress is… this is their brain." Following Hurricane Katrina, Ovadia also caused a furor after he claimed the hurricane was a result of US's support of Ariel Sharon's Gaza Disengagement plan. Ovadia's son, Rabbi Yaakov Yosef, also a prominent rabbi, passed away earlier this year after losing a long battle to cancer. 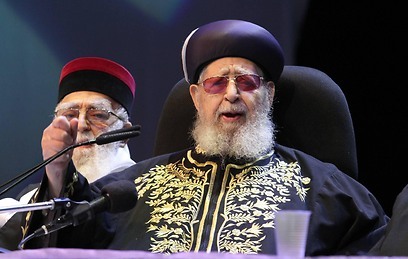 See all talkbacks "Rabbi Ovadia Yosef dies at 93"